The Center for the Neurobiology of Learning and Memory has been committed to community outreach in brain sciences, since its founding in 1983 and has reached thousands of Orange County children through its School Visits and Laboratory Tours programs. Elementary School - "I have a BRAIN!" Children are exposed to the word "neuroscience." We talk about what scientists do and the different types of scientists that exist. Children learn about the safety rules that scientists must follow. They are taught how to properly use gloves and how to properly take off gloves. Science can feel and smell strange! Children are taught that scientific specimens may feel gooey and may smell funny. Children are taught how to make observations using all of their senses. Children are exposed to the different areas (lobes) of the brain and begin to understand that different areas of the brain have different jobs. Children learn about the difference between a real specimen and a model by talking about the similarities and differences between the real brain and the model brain. Children have the opportunity to use their hands to make their own play-doh brain model where each lobe is a different color. Children compare and contrast brains from different organisms. Our brains are fragile and we only have one! 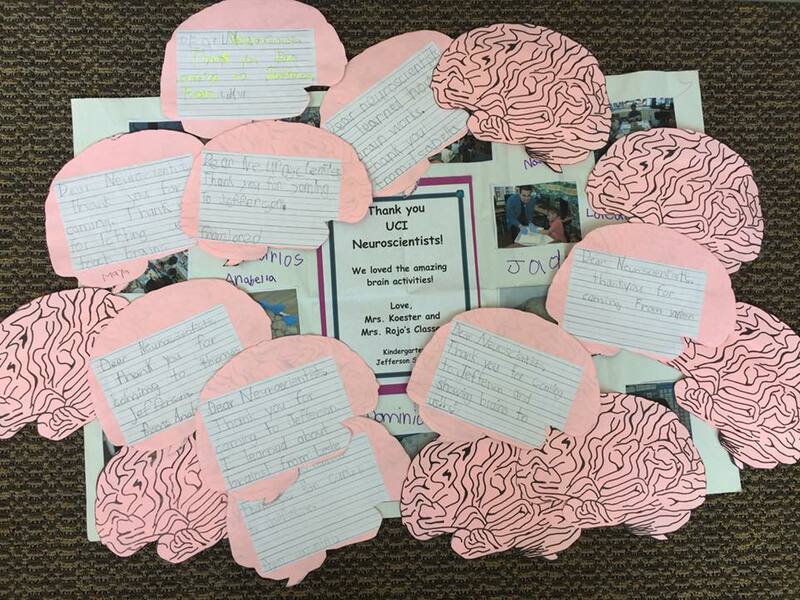 Children learn about how to keep our brains healthy and safe. We talk about healthy eating, exercise as well as wearing helmets and seatbelt. What are the building blocks of the brain? Children are introduced to the neuron. How does our brain process what we see, feel, touch, smell? Children are introduced to the rest of the nervous system - the spinal cord and nerves. How does a reflex work? Middle/High School - "The Functioning Nervous System"
Students learn not only about the general areas of the brain dive deeper into the functional anatomy of the lobes, discussing areas like the hippocampus, amygdala, ventricles, thalamus, medulla, pons, corpus collosum, etc.) How do these areas talk to each other? Students learn about how the neuron works and how neurons communicate with each other. Students are exposed to the different types of neurons and are introduced to glial cells. Students learn about how the brain learns new information. Students are exposed to the pleasure system of the brain and learn about the neuroscience of addiction. Students learn about the neuroscience of mental illness. Students learn about what happens to the brain during neurodegenerative disorders such as Alzheimer's Disease, Huntington's Disease, Parkinson's Disease and other dementias. How do we study the brain? Students learn about tools that are used in the neuroscience laboratory to study the brain. These tools include animal models, genetic manipulations, imaging techniques among others. We are currently scheduling School Visits for the 2018-2019 school year. If you are interested in having us come to your school, please email Manuella at memory@uci.edu. The Center welcomes Orange County students of all ages to tour the laboratories, interact with UC Irvine Faculty and students and learn about brain sciences. Students have the opportunity to learn about UC Irvine brain sciences. They learn about scientific inquiry, how experiments are carried out and how science is communicated to move the field forward. Students have the opportunity to learn about brain anatomy and are even able to touch and compare various types of brains from different organisms. We are currently scheduling Laboratory Tours for the 2018-2019 school year. If you are interested in coming to UC Irvine, please email Manuella at memory@uci.edu. Thank you to the Dana Foundation for providing educational materials in support of the CNLM's Brain Awareness Week activities. Learn more about the Dana Foundation by clicking here.